Enhance your desk while maintaining a zen-like level of organization. Accent your workspace with Sorbus® Acrylic Desk Organizer Set. This 3-piece set features a medium tray holder, note pad holder, and cup holder to de-clutter your space and hold small office supplies. Store and organize post it notes, mail, pens, pencils, clips, rubber-bands, safety pins, office gadgets, and much more. You can use this desktop organizer individually on your desk or pair it with our Acrylic Desk Paper File Holders (sold separately) to maximize your space. Whether placed in the home or office, this convenient set manages your work pile with ease and efficiency! Bring a modern twist to even the most mundane tasks in the office! Use the Medium Tray Holder with 3 divided compartments to hold mail, stationary, notebooks, and more. Take phone messages or quick notes with the Mote Pad Holder that keeps Post-it Notes and other memos in place. Quickly jot your to-do lists and reminders with a pen, pencil, or other writing materials from the modular cup holder. This Desk Organizer Set can also be used in conjunction with a file tray stand, desk folder organizer tray, letter sorter desktop, book collection organizer, folder holder, and more so you can quickly meet that project deadline! 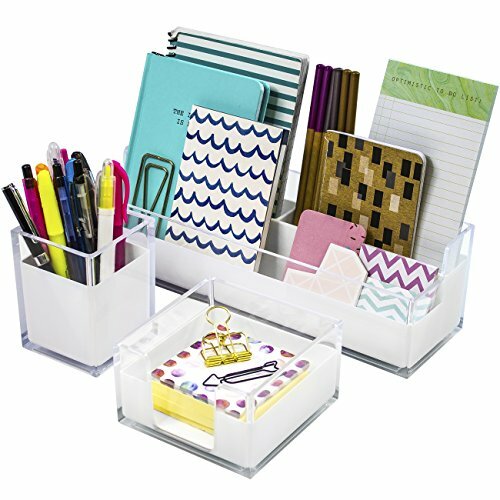 Made with durable clear acrylic, this organizer set is designed to adorn any desktop from Executives, Administrative Staff, Bloggers, Students,Teachers, and more! Enjoy a modern clear acrylic and white lacquer-like combination. Great gift for busy and organized professionals. Complements any décor. Sturdy and lightweight. Measures approximately: (Medium Tray Holder) 11.75" L x 3.5" W x 3.50"; (Note Pad Holder) 4.50" L x 4.50" W x 4.50"; (Cup Holder) 3" L x 3" W x 3"
Add multiple Acrylic Desk Organizer Sets for additional storage! DESIGN SPECIFICATIONS Made of clear acrylic mixed with white lacquer-like finish - Modern and sleek - Great gift for busy organized professionals - Sturdy and lightweight - Each tray holds up to 500 sheets of paper - Measures approximately: (Medium Tray Holder) 11.75" L x 3.5" W x 3.50"; (Note Pad Holder) 4.50" L x 4.50" W x 4.50"; (Cup Holder) 3" L x 3" W x 3"